Mangaluru, Sep 3, 2016: It is reported that the coastal, Malnad and the semi-arid regions in Uttar Kannada district received moderate showers on Sept 2, Friday. A few districts in the state received good rainfall. Mangaluru experienced a heavy drizzle through the morning, while the sky remained overcast throughout the day. Dakshina Kannada district received an average of 3.5 mm of rainfall in the last 24 hours. While intermittent rains lashed Karwar the entire day, Mundgod received heavy rains for a few hours. Bhatkal, Honnavar, Kumta, Ankola, Sirsi, Siddapur and Yellapur received light rains. Hubballi and Dharwad received light rains in the morning and afternoon. Kodagu district received an average of 6.39 mm rainfall. The water-level in the Harangi reservoir stood at 2,855 feet. The inflow of water was 1,411 cusecs while 600 cusecs water is released into the river. 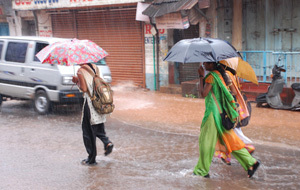 Moderate rains lashed Malnad region in Shivamogga district on Friday. Thirthahalli, Hosanagar, Sagar, Bhadravathi, Shivamogga received moderate rains in the morning. Though several parts of the district witnessed cloudy weather throughout the day, there was no rainfall. The water-level in the Linganamakki dam rose to 1,793.55 feet against the maximum level of 1,819 feet. The inflow of water was 5,035 cusecs.